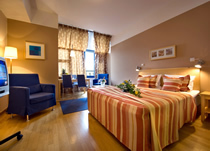 The 4* Julis Hotel is set in an excellent location, right on Wenceslas Square in the centre of Prague. Bars, clubs, shops and restaurants are just out the door. Julis is a stylish, modern hotel situated on the top floors of one of the tallest buildings in Wenceslas Square. This, along with large floor to ceiling windows affords the hotel a wonderful light and airy feel, both in the bedrooms and in the public areas. The rooms at Julis Hotel are spacious and furnished in a contemporary style. And many offer fine views over Wenceslas Square at the front of the hotel, and over the Franciscan Gardens at the rear. There is also the added benefit of a small en-suite kitchenette in every room. At the rear of the hotel a large terrace opens in the summer. This is a pleasant place to sit in the sun with a drink and enjoy the views over the Franciscan Gardens. For families with children, the Franciscan Gardens has a superb, recently constructed playground at one end. Rooms are fully furnished with a modern en-suite bathroom (bath) & WC, towels, hairdryer, safe, minibar, telephone, Satellite TV and free Wi-Fi. All rooms are equipped with a kitchenette with refrigerator, microwave, dishwasher, kettle and double hot plate. All rooms at the Julis Hotel are air-conditioned. There are restaurants, cafés and bars to discover all around the hotel in Wenceslas Square (see 'Nearby Places' for restaurant recommendations). There is also a Starbucks and a Costa Coffee close by. The health and fitness facilities are an attractive feature of Julis. The hotel building boasts the only swimming pool in Wenceslas Square, a sauna and a fitness centre (charges apply). Secure underground parking is available nearby at 25 EUR per night. City tax: 0.6 EUR per person per night is payable at the hotel.